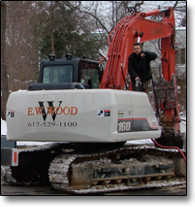 E.W.Wood Inc. is the premier, full service, site development contractor in Massachusetts. Our commitment to our customers is to provide peerless service excellence and professionalism, while delivering the highest quality, most cost-efficient results, on schedule. 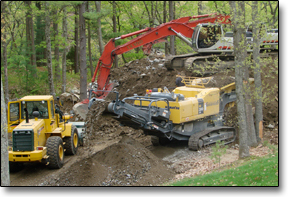 E. W. Wood is focused on excavation and site work, primarily in the Metro-West, high-end residential and commercial markets. E.W. Wood Inc. has worked closely with municipal offices and civic officials towards streamlining construction regulation and permit requirements in each city or town where we have worked. E.W. Wood Inc. has completed site contracting and related projects in Weston, Wayland, Wellesley, Cambridge, Brookline, Boston, Newton, Needham, Lexington, Concord, Natick , Ashland, Dover, Sudbury and Northborough, among many others. At E.W. Wood we take great pride in our work and our client’s finished project. We hire the best, so you get the best results, and our project managers and equipment operators are all highly experienced, dedicated professionals. When it comes to site work – the literal building block to your dream home or commercial project – having the right equipment at the right time is supremely important to both the proper execution of the job and on-schedule, on-budget professionalism. Our equipment fleet is substantial and includes excavators, trucks, bobcats, stone crushing equipment and much more from top industry machinery brands such as, CAT, Linkbelt, Takeuchi and several others. We also maintain strategic working relationships to complete even the most infrequent task at a moment’s notice, on schedule and on budget. Every step of the way, E.W Wood Inc. is committed to being the BEST. © Copyright 2010 E.W. Wood. All rights reserved.